It seems that Jason Atherton is becoming increasingly famous and successful. I think he has opened branches in Hong Kong and Singapore. Naturally, having being to Pollen Street Social, I felt I had to try another one of his social events. Little Social. Slightly fastidious person that I am, I also brought along my big camera. However, due to my friends’ lack of appreciation for my methodical methods, my photos didn’t turn out that well. Well, that’s my excuse at least. I fell victim to expensive camera, lack of skill problems. Money can’t buy you taste sometimes. Time to see if this busy man was able to keep up the quality across his establishments. 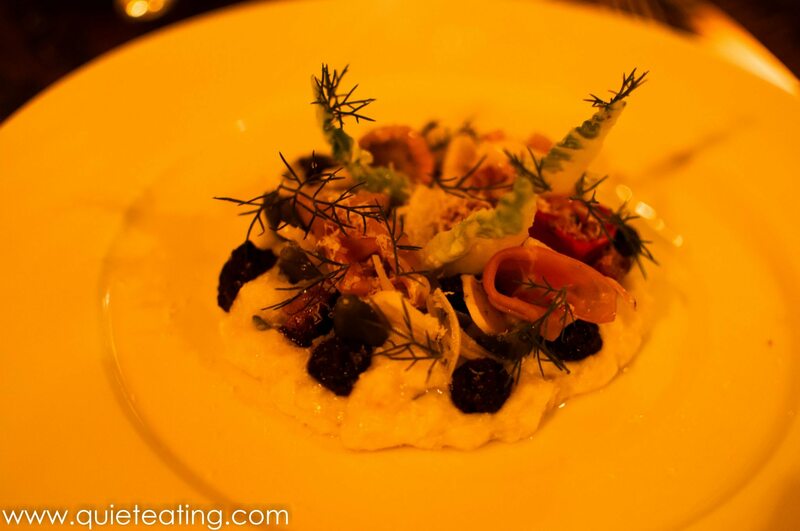 Cod brandade, pimenton croutons, parma ham, tapenade, lemon & bottarga. This was a very enjoyable dish as I had no idea what this complicated explanation was. What it seemed like to me was lovely just cooked cod combined with parma ham and what I thought was mashed potatoes. Whatever it actually was, it tasted as complicated as its name, full of complex flavours. Country pate, salad and piccalilli. 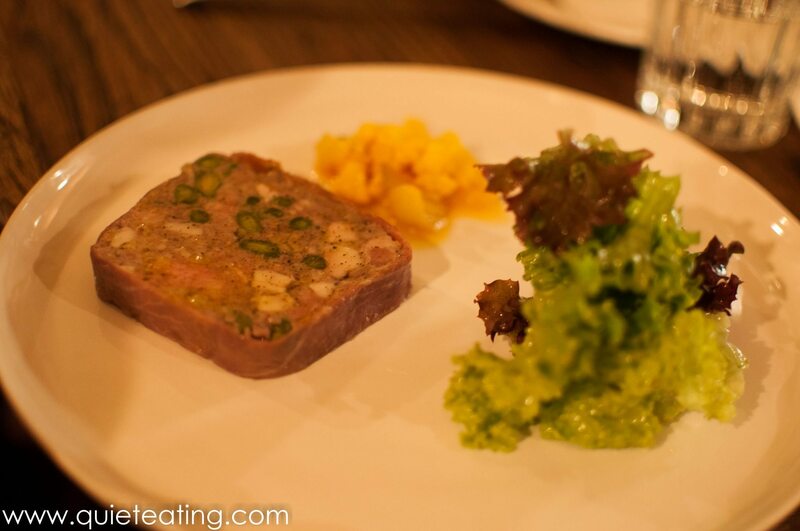 Something a bit more normal, this pate was nice although not up to the brilliance of the other appetizer. 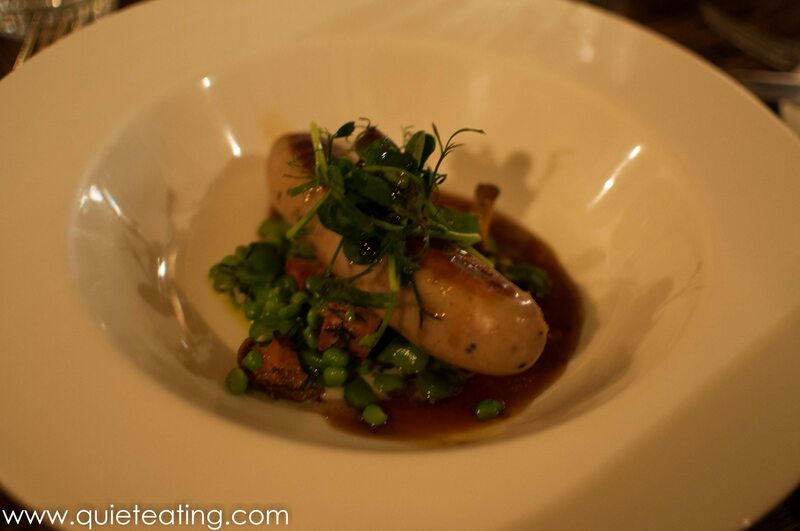 Boudin blanc, English peas & broad beans, morteau sausage, St George’s mushrooms, pea shoots & pork jus. A more refined version of an English breakfast. Sausage and peas. I usually don’t like sausages but in this case I have to make an exception. It tasted far less processed than minced meat stuffed into a pig’s intestine. You know, the old way they used to do sausages. 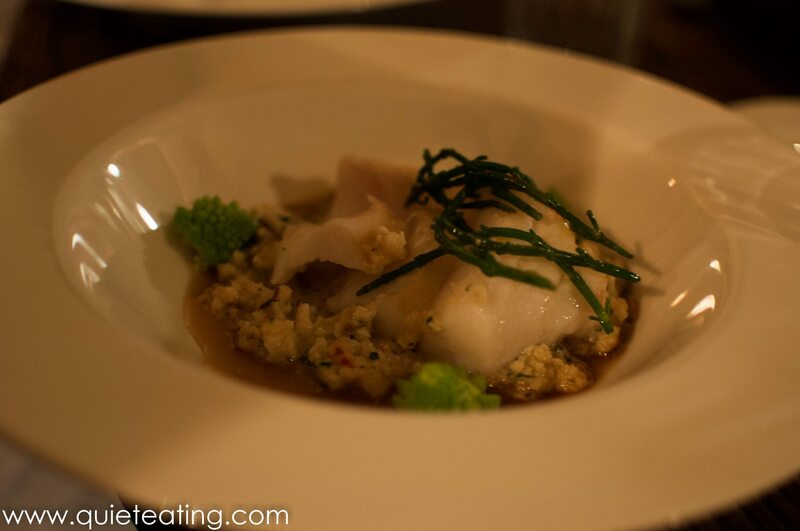 Roasted Cornish line caught cod, Asian spiced cauliflower & aromatic duck broth. This dish was ok. Although I was sad to note that the cod was a tad overcooked. Now that wouldn’t cause issue at any restaurant but their starter had demonstrated that they know how to treat fish right. Unfortunately, this piece of cod did not benefit from such skill. It wasn’t bad, just average for British seafood. 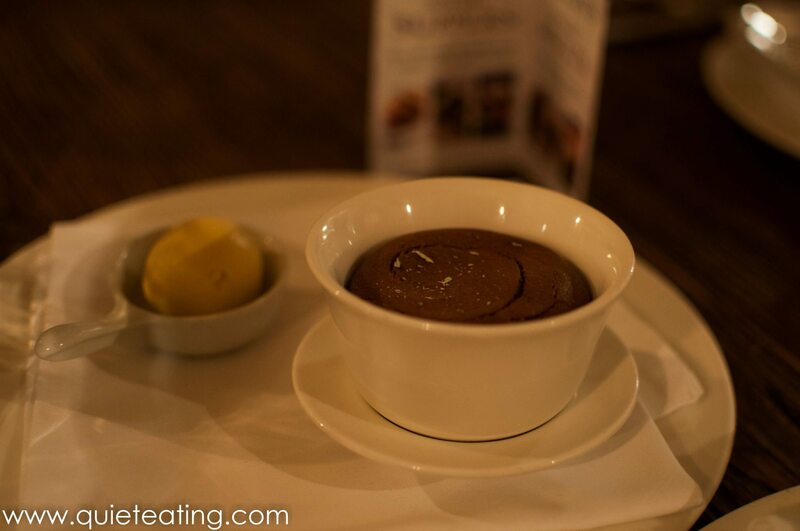 Hot chocolate & cardamon caramel moelleux, Maldon sea salt & roasted almond ice cream. This is where things start to pick up, right at the end. Like a champion runner, as the finish line grew closer, the food seemed to pick up. The chocolate moelleux was lovely and melty inside with the cardamon and caramel going surprisingly well together. The icing (or ice cream in this case) on top of the cake was the sea salt ice cream. Although it seems at times that everything is “sea salt” to varying degrees of success, this was a resounding hit. 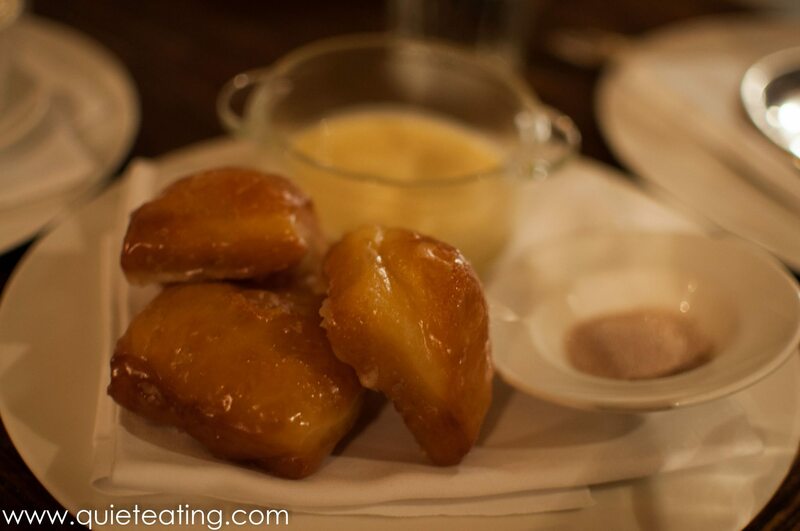 Maple glazed doughnuts, baked Bramley apple, cinnamon & port filling, creme Anglaise & cinnamon sugar. This I think was the best dish of the day. The lovely maple doughnuts when combined with the the creme Anglais and cinnamon sugar brought me back to fun fairs in days gone by. I managed to resist the urge to lick the sugar bowl, sauce jar and plate clean at the end. It was just that good. Little Social was an enjoyable little occasion with a laid back atmosphere and desserts to return to for tasting again. Although the tables seemed to be a bit too close together, crowding the elbows a bit. I would come back again if they worked a bit on their mains as unfortunately this was where things started to unravel a bit. In summary, it was an enjoyable meal at a fair price so worth a try. However, I don’t think I will be back that soon, unless they do a doughnut menu of course. Lunch (3 courses) was GBP25 excluding service or drinks.